uses decades of experience to untangle your website problems. If you're experiencing unusual errors or messages, and your engineers are at their wits' end, contact us for speedy repairs. Vancouver Cleans Up Traffic Scoff-laws! Significant numbers of Vancouver citizens have been found to be skirting Vancouver's paid-parking facilities by driving to work on 2-wheel motor-scooters. These tiny vehicles are able to scoot about using very little fuel, but they can also be parked for free in tiny little nooks and crannies. Normal SUV drivers, naturally, are indignant since they see the scooter drivers as gaining an unfair traffic advantage. 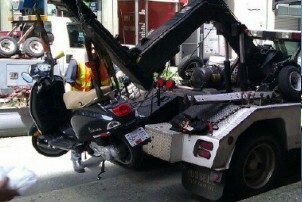 Vancouver City council is now trying to rectify this imbalance by towing and impounding scooters. Some BC Car Owners Dodging Provincial Sales Tax! Recently it has been observed that some BC drivers are dodging BC Sales Tax by keeping their cars much longer than necessary. 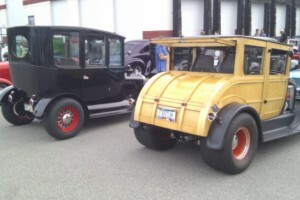 It is not uncommon in Vancouver to see tax-dodging drivers trundling about in cars almost 100 years old. This has the unfortunate result of depriving the provincial government of valuable revenue. The BC Finance Department is urging motorists to buy new & bigger cars regularly in order to ensure the continued viability of BC's Hydrogen Highway Project and other transportation sustainability projects. Global Warming Threatens BC Hot-house Industry! As mean temperatures in Canada slowly increase due to global warming, local farmers find they are able to grow tomatoes outdoors without the aid of the traditional hi-tech hot-houses. The increasing numbers of natural outdoor tomatoes will inevitably imperil the hot-house growers and a significant portion of the BC economy. 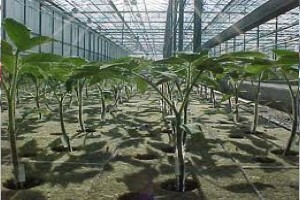 Canadians will be able to grow more vegetables outdoors due to a longer growing season, imperilling the hot-house farmers.